The yard said the yacht had been designed for a "cosmopolitan owner" and would feature interior decor reminiscent of a "New York loft"
Italian yard CRN has teamed up with Lobanov Design to present a 75metre superyacht design called Begallta. Developed by the yard’s technical office, Begallta will feature exterior design by Lobanov Design and interior décor by Pulina Exclusive Interiors. According to the yard, Begallta encapsulates CRN’s “charismatic, forward looking spirit” with a “futuristic design” which features slanting lines and a tapered bow. Designed for a “cosmopolitan owner”, Begallta aims to connect outdoor and indoor spaces with panoramic windows, expansive terraces and a large sundeck. The interior, meanwhile, will be take inspiration from New York loft living with “minimalist décor and avant-garde entertainment features". 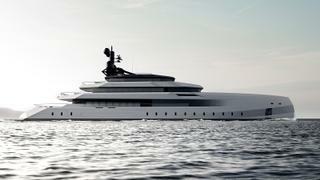 CRN chief commercial officer Stefano De Vivo described the project as “an absolutely unique, unparalleled design.” “We love challenges, and this collaboration with Lobanov Design has yielded a stunningly innovative project that harmoniously blends sophisticated modern style and intimate contact with the elements of nature to exhilarating effect,” he added. Lobanov Design creative director Igor Lobanov described Begallta as “fully articulating” the company’s values and style. “Creating iconic yachts that etch themselves into the imagination at first sight is what our design approach is all about,” he added.